Europe, in the autumn of 2018: The European Parliament proclaims the imminent abolishment of hard cash in the whole euro area – in favour of a purely digital payment system. While politicians begin to praise the forthcoming currency reform to the skies, there arises huge frustration within the populace: Many are aware that a system of purely digital payment transactions means an absolute control over the finances of the individual. Johanna Perl, a student from Lower Austria, decides to actively protest against the decision of the central government on the internet – and meets with an unexpected response. When the Slovakian university professor Kaspar Petržalkov becomes aware of her, there soon originates a collaboration between the student and the scholar – which results in a serious resistance movement. Johanna and professor Petržalkov know for sure: Europe is sitting on a political powder keg. And so they dare themselves into the fight against the system. In this opus, Thomas thoroughly has a critical view on established structures; but principally, he wants to already rear a monument beforehand: As a warning of of what could become reality in future if the current development takes its course further on unimpeded. More and more spheres of life are monitored – while at the same time increasingly unworldly politicians tend to simply ask the taxpayer to pay up in case of monetary thightness. Now one might imagine what fatal decisions many a strongman could meet, if he had a detailed overview of income, consumer buying habits and savings of the taxpayers just at the push of a button. But beyoned its functon as a monument, the opus shall hint to one thing in particular: Power and control are not in the right place; politics operate behind closed doors and wish for easy-to-monitor taxpayers; but indeed, things should be exactly the other way round: For the taxpayer, it should be easily and comprehensibly exposed what authorities are doing – while the authorities plain and simply must not take any interest in many a life-sphere of every citizen! Thomas already had the idea for a literary monument against the sprawling political overreach years ago - as a result of fear and anger about the increasing control mania of the authorities, especially relating to private (money-)possession. So, a note had been existing on the hard disc of his computer for a while. 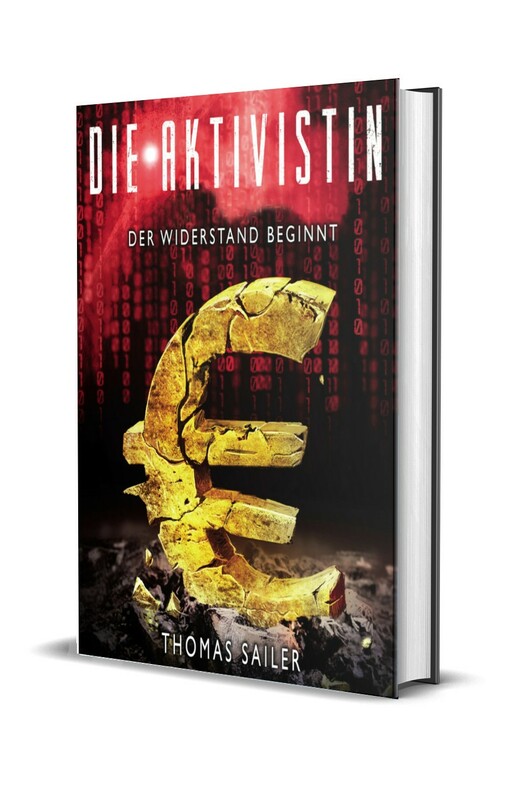 Finally, on September 30th,2013, he had the dazzling idea for a story: The plot should focus on a female activist, who would campaign against the currency conversion; the reform should further take place in the euro area only and not worldwide, as initially envisaged. After a conceptual base was created and the first few pages were written, it soon became certain that he would complete the manuscript this time. Even though he had a full time job back then, he worked consequent on the opus and thus made a good progress. On March 7th, he completed the manuscript; exactly two weeks later, on March 21st, after having proofread it once, he forwarded it to serendii publishing. The book got published there on July 1st, 2014.